Blatty has a gravity about him, and also, somehow, a lightness. An impishness. This is a man who is quick to laugh to the point of tears and also thinks that these may be “the last days.” This is a man who says, after a sip of coffee with Equal sweetener, “It’s a fallen world,” like he’s noting the weather. He describes, his voice trembling, a particular abortion procedure in graphic detail. He pauses. His voice is nearly a whisper. Those last 3 paragraphs should inform normal decent people why the SSM must be destroyed and the ground on which it stands salted so that nothing will ever grow there again. 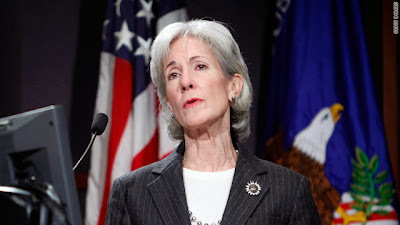 Guaranteed, the reporter has in his possession all those graphic details about the particular abortion procedure that Sebelius endorses. Whatever was in them that reduced Bill Blatty's voice to whisper "that's demonic," the WaPo editor censured from us readers. Under no circumstances will they permit any doubt be cast upon the narrative. Especially the unspeakable, demonic narrative of the death cults. SSM delenda est before it does it to you. Is Norquist joining the burgeoning Alinsky rule number 12* campaign waged by the Dems and the GOP traitors against Ted Cruz? Or could it be the beginning of a counter-alinskyite campaign led by Breitbart against Norquist? Given that Breitbart's current leadership displays to us nobody with the balls of its founder, we will see how long that lasts. To add insult to injury, Norquist is funneling the money of conservatives to the one institution, SSM, that spurs on the mobs 24/7 to threaten all conservatives. However, he's got a lot of company there, including the TEA Party Patriots who continue to ignore grass roots complaints not to help keep SSM alive by paying it for anything. It is a demon that mocks me in my efforts to increase wider understandings, understandings that were made possible by God having gifted me with a mind that notices things, has a long memory, and quickly ties various and disparate events and things together. The demon's damage is made worse by it knowing how how it bothers me and stymies in my efforts out of my fear that my efforts might increase misunderstandings inadvertently or clumsily. You cannot un-ring a bell, and it's terribly hard to rewind an untensioned spool that's slipped its retainer. For those who do me the honor of coming here to read my blather, I am going to show you why I so often shut down and not write anything more than short comments at other sites for long periods of time. I have a fear of making large mistakes and missing them, then have those mistakes go on to proliferate to have a life of their own, spreading more misinformation. Beginning with a simple comment I left at Gates of Vienna in hopes of alerting historian Seneca III to an unfavorable use of his famous name, I made my first mistake of going into details in a follow-up comment that I specifically chose to do in order to spell out the threat to the author's name (guilt by association that could be stemmed with what I was demonstrating) more concisely. The second mistake, had it been made only once, could be written off to maybe a typographical one that the spell-checker fixed, but which I did not notice. Yet even then, because the word used so destroys the understanding of the sentence, I still should have caught it. Worse. I did it more than once! Here is the mea culpa I left at GoV (edited due to more errors! in the one posted there). OMG. Several days late I have noticed that I made an awful error, and not just once. I am not terribly prone to Malaprop, but this one being part of a quite esoteric subject with which I hoped to improve understanding of how the anti-theists without merit seek to exploit the name of Seneca, I find it terribly embarrassing. However, my personal embarrassment by exposing it is less important than the stopping the propagation of misinformation just in case anybody is paying attention. Extrinsic* (and not explicit) is the unwelcome parasitic property that seeks to attach itself to the intrinsic*. I point to how Pascal was clearly irked by how extrinsic probabilism used by the Casuists seated at the Sorbonne crowded out all of the originals’ intrinsic substance. This is why I say I’m best in providing insights rather than details where, echoing S III’s words, the damnable creeps in. And it also demonstrates why I dislike writing so. This shows why writing is, for me, a form of penance. Penance for the propaganda delivery system that I helped make possible, yes. But also penance for mostly making a living in my pre-retirement years and not battling the Statists in a more proportionate level to that which they attacked what I hold dear. Thank you too, dear readers, for putting up with my frailties. Today the CBS wing of the Soviet-style media (SSM) carries the headline "Hillary Clinton Turns Tables On Heckler In Buffalo." which implies that silence -- permitting only speech deemed pleasant and agreeable -- would be (God forbid) the Harridan in Chief's rule for the rest of us. While I'm at it, and because the SSM (nor Drudge in this case) will not remind Americans, remember this for them. In 2003, Hillary Clinton screeched "I am sick and tired of people who say that if you debate and you disagree with this administration somehow you're not patriotic. We should stand up and say we are Americans and we have a right to debate and disagree with any administration." I am please to discover that apparently JWF beat me by a few hours in connecting the dots. I made a point of it because Drudge failed to do it. It is important to make sure that inconsistencies, like this of Frau Hillary's two opposing opinions, are recorded in one place. It is the kind of thing that will bind our anti-fascist forces together. For those who still do not yet call the Main Stream Media (MSM) the Soviet-Style Media (SSM), here's a few paragraphs from Slate to demonstrate why it is so. And this particular example embodies the gruesome, Utilitarian nostrums of what is deemed right and proper by our ever more power-mad elite. And the words of the article's second paragraph, and the last words of its third demonstrates how much like Pravda they are. In other words: Canada has death panels. I use that term advisedly. Former Republican vice presidential candidate Sarah Palin made it famous in the summer of 2009, when Congress was fighting over whether to pass Obamacare. As Republicans and Democrats continue to spar over health care, we should pause to wonder why millions of Canadians have come to accept the functional equivalent of an idea that almost sank health care reform even though, in this country, it was imaginary. Go read the rest to see why they concluded that "Canada has death panels." What I feel it is most important to highlight is that even after senior Democrat Party officials have admitted that Obamacare has death panels, and slate admits that it likes them, Slate has the brazenness to flat out lie, continuing the official SSM narrative that Obamacare death panels are imaginary. Thus MSM is SSM. QED. Oh. And take notice of one more thing, much more important than anything pissant Slate may publish. Once again, as the warning in my masthead reminds us daily, none of our "rulers" utters a harsh word against notions such as 'Death Panels are a good thing.' The propaganda aim is to get Americans accustomed to death panels; even to welcome them (as it says "many" Canadians now do). All the while pish-poshing that death panels are real. Craven, lying bastards are words too good to describe these cretins who are greasing the skids for a wholly new-to-America death-on-demand institution disguised as "healthcare." As the death cult alliance sets up to extend politics in a Clausewitz sense, you may find it beneficial to be knowledgeable of what is possible against overwhelming odds. One such can be read at Seneca III's account, in 3 parts, of the battle of Rhodes. Start here: The Cross and the Crescent: Rhodes, 1522 (Part 1). ...the Order would have ceased to exist, for the Knights, as they had done so many times before, would have fought to the death. Fortunately, as it eventuated, the Order survived to find a new home and rebuild its manpower, and the Monks of War and the armies of Suleiman would meet again in Malta some forty-odd years later with a very different outcome. Our system of government was intended to thwart the rise of tyranny. One aspect of the checks and balances was given to the press. The fourth estate. They were given a great deal of power to be watchdogs. It was presumed that no party would be safe from them. But what provision did our founders provide us to reign in a technologically advanced media that viewed itself as an integral part of the ruling class? One that knows it is so aware and smart and clever that rules of decency need only be applied to common men with less smarts? That they are the ones smart enough to know when the truth needs to be buried and when lying is a good thing? Q: Founding fathers: did you anticipate that you had not given the common man a statutory way to remedy the growth of power in an entity outside of your government system? Update: Oh -- oops -- thanks to Og for providing the jabs in "chat" that probed my mind to come up with the insight at this better-late-than-never date. As he notes, there are many connotations associated with the consequences of a what has been king-maker media and its allies. What I now call a Soviet-style media, or SSM (instead of MSM) whenever the opportunity arises and where it will not be misunderstood. The aim of writing SSM is to drive home the point and the dangers associated with Pravda and Izvestia. SYNONYMS surrender, submission, capitulation. These nouns denote the act of giving up one's person, one's possessions, or people under one's command to the authority, power, or control of another. Surrender is the most general: "No terms except unconditional and immediate surrender can be accepted" (Ulysses S. Grant). Submission stresses the subordination of the side that has yielded: "Our cruel and unrelenting enemy leaves us only the choice of brave resistance, or the most abject submission" (George Washington). Capitulation implies surrender under specific prearranged conditions: Lack of food and ammunition forced the capitulation of the rebels. Let me extend that last sentence a bit. Capitulation implies surrender under specific prearranged conditions: Lack of spine and "conservative" media community support forced the capitulation of the patriots in the House of Representatives. Update. I said Obama über alles without explanation initially because I had to run. Here is a simple explanation. This "deal' that was concocted in the Senate that the HOR is about to agree to, has a poison pill for the power of the HOR* to control the taxation on those who elect their representatives who sit in the HOR. Because the population of the cities so controls who gets elected to the Senate, the localities that congressmen represent just lost a tremendous advantage. In the near future you may come to understand that is what happens once this HOR passes a law that puts the debt ceiling limit into the hands of the Prez. It will then take a super majority for all future HORs to take it away again. Even if a rescinding bill passes the next Senate, just about any sitting Prez will veto rescinding legislation passed by simple majorities of both houses. A republic if you can keep it, indeed Dr. Franklin. I received a survey request (filled in below) from the Media Research Center (MRC). Initially I was expecting just another multiple choice form that misses many of the key issues of the day. Much to my delight, this one actually had, in addition to MRC's preferred topics, "other" as choices. And what was even more special, MRC provided a space in which to spell out the other choice(s). Burned out naif that I am, I have my doubts they will actually read what I put in the boxes. I know, many of you think I must be crazy again for even trying. But yes, while I still breathe, I will always try. FYI: I have another post in the works providing evidence that MRC may not be all that it tries to convince us it is. They know how to ask money from us to do more of what they want; but when it came to answering the knocks at their door so they might listen to us, it seemed that, time and again, nobody was home. Should they show some gonads here and actually respond as one expects of normal, decent human beings, I will have no need to publish it. But right now, let me urge you to try to do what I did as shown below. Maybe, just maybe, we will actually affect Brent Bozelle's thinking, and he'll begin to listen to us more instead of simply telling us what he thinks is important. If you would like to participate, drop me a line and I'll forward you the email. Or if you don't want to hear more about while they want you to do this for them, just click this link. We Must Hear from You . . . Please Take This Survey! With so many ongoing scandals and the outrageous media censorship we're seeing in response, the Media Research Center needs your feedback and advice more than ever. Thank you for taking the time to respond to this quick survey. It will be an integral part of our strategy moving forward. 1. What do you believe is the most pressing issue facing the United States today? 2. On a scale of 1 to 5, how difficult would you say it is to find reliable news coverage? 3. Which of the following scandals would you most like the media to investigate? 4. In your opinion, what is the most valuable service that the MRC provides? 5. We want to better serve you. What should we improve? e. Other: Fix your tips & emails so it works! Enough with the mailer-daemons. You are leaving the impression you don't give a damn. Be more responsive! 6. If you could send a message to the American media, what would it be? Americans have overall had a better life than subjects or citizens of other nations because they have been more free. Stop your disinformation campaigns that aids the destruction of our liberties (as Pravda & Izvestia abetted the oppression of Soviet subjects). We know why many of you do so. We've heard it. It is your elitist view that it is only right that common Americans should have a better understanding of how bad other peoples have it. That sort of "equality" helps no human being other than the monsters who have risen to rule their peoples. 7. Since the election of President Obama, do you believe the American media have become more or less liberal? we are rarely given such an opportunity. Take advantage of it as I have. ...but not for what I warned last Friday. It may very well be true that in many other matters I'm nuts. I do not behave in ways others deem as rational; at least not for them. Most often I hear that charge about my political views. "Isn't there anyone you trust? It must drive you crazy." I hear that often after one or another of my attacks on the GOP for keeping traitors in its midst. "You are so quick to go there. [I'm not actually.] Why can't you be satisfied with chalking it up to stupidity and malfeasance?" And this time I was insulted for a "far-fetched" warning about politics. The good news part of the bad news is that it didn't take long for the latest charge to be proven baseless (as more often happens than not). It only took a couple of days. In my last post about Chris Muir's cartoon stating that it was time to chuck the GOP and go third party, I declared it was too late. Specifically I wrote: "The GOP needed to be replaced long before now. They helped install laws that will be used to essentially outlaw other parties...."
For that, one die-hard Republican told me I was nuts. It's not a conservative position. It's a violation of the right to free association and will never happen. He didn't say, but I'm guessing he believed that it is not what Republicans would tolerate. the Ohio State Senate has passed this bill which would essentially eliminate all third party candidates from ballots. It is tough enough already due to people like my GOPe acquaintance. So spread the news. Make the existing parties even more uncomfortable. Let them know about how you view their attempts to block your efforts to build new blocs. Those are blocs that you will need to succeed in defying and overturning their efforts at enslaving your children ever more. I'm sorry Chris. The GOP needed to be replaced long before now. They helped install laws that will be used to essentially outlaw other parties under the guise that the people in them are a threat to the public. It's worse than conspiracy; it's consensus. There is only one way to break that up. The entire Obama administration is despicable. But as regular readers know, I hold the entire global elitist sustainability crowd responsible for the Bummer's elevation. They so hate individual liberty and the thriving that results, that I suspect that He will hold them accountable for Obama and the millions of subsequent deaths. *In case the video gets removed, it was the Sibelius scored vignette in Allegro Non-Troppo. The following is a late comment inserted into the Breitbart List thread that was the subject of my last post. You guys are living in a fiction here... How soon you forget that the House Republicans are the reason this is shut down, not Obama (my God you love to blame Obama for everything). You don't get to put the entire Gov't on hold and use it as ransom to get things done. That's extortion. There is a right way to do this: Try Winning an Election. Period. The tone of this comment sounds too suspicious to me. It would not be the first time a web site used socks as trolls to increase comments. So my parsing of the comment includes jibes at Breitbart editors in a just in case manner. You write like a Breitbart.com tool; trolling for comments. Just about every phrase you used sounds tongue-in-cheek, designed to be taken apart bit by bit. Leftists build the fictions for liberals to inhabit. Your comment would be projection if you are really a lib or Leftist and not a breitbart tool. Correct, we don't. It's Obama. The Prez has the reigns to operate or not operate anything. and use it as ransom to get things done. Exactly what Obama has done. For any Fed areas that might hurt his opponents, he's shut them down For those areas that might hurt his base, he's kept them open. As examples of how he has chosen to shutdown selectively. Open especially, The National Mall: for an illegal alien rally (costing money). Increasingly barrycading the WW II memorial: .Shipping in and installing barrycades; patrolling; arrests. All costs money; all NEW costs. Brazenly, for himself he's kept open all golf courses he uses. Hence the extortion is his. With each passing day he takes on more attributes of a living fascist-style dictator -- penalizing his opponents and rewarding his friends. And that is added to all the crony-captialism that preceded it, another earmark of fascism. House GOP are scapegoated by Obama and his media for every choice he makes to shut whatever he wants. The House does not tell the Prez what to shutter and cannot stop him. His refusal to negotiate on anything is the fact. He says so in his own words. Of course, the media won't highlight those instances, hence they are the rebirth of soviet-style media (SSM). Too bad Breitbart.com hasn't got the balls of its founder to call them that. Your god being obama, make that lower case. I don't blame Obama for the GOPe's complicity with him -- in fact, he wouldn't be in office without their aid. The TEA party movement got started precisely because the GOPe is seen as off the reservation. Cannot blame the Bummer for that. There is a right way to do this: Try Winning an Election. Period. We did. We elected people to the House of Representatives who promised to reverse Obamacare if they could, or defund it if the Senate or Prez refused to budge. It is the Left that continues to deny that the House of Representatives is the one section of our government that, by constitutional design, controls our funding of the federal government. Executive orders spend beyond that is a crime. And do not try to tell us that Obamacare is "The Law." Your god keeps breaking that law depending on who he deems worthy of exemption, just like a fascist dictator. Stolen from Crusader Rabbit who stole it from Breitbart. Please feel free to steal again. Below is a list of illogical, unnecessary, and shockingly spiteful moves our government is making in the name of essential and non-essential. The media may or may not report on these individual occurrences, but what they will never do is provide the American people with the full context and scope of Obama’s shrill pettiness. Nolte also wrote: This list will be regularly updated, and if you have something you feel should be added, please email me at jnolte@breitbart.com or tweet me @NolteNC. Treatments for Children Suffering From Cancer – The GOP have agreed to a compromise by funding part of the government, including the National Institutes of Health, which offers children with cancer last-chance experimental treatment. Obama has threatened to veto this funding. The World War II Memorial – The WWII memorial on the DC Mall is a 24/7 open-air memorial that is not regularly staffed. Although the White House must have known that WWII veterans in their eighties and nineties had already booked flights to visit this memorial, the White House still found the resources to spitefully barricade the attraction. Furloughed Military Chaplains Not Allowed to Work for Free – Furloughed military chaplains willing to celebrate Mass and baptisms for free have been told they will be punished for doing so. Obama Blacks Out Sports, Entertainment Programming to Overseas Troops – The American Forces Network (AFN) that provides American sports and entertainment programming to our troops stationed abroad, has been shut down. For some reason, though, AFN News will still broadcast news, just not any of the popular and fun stuff. Obama Closes D-Day Memorial – The GOP have offered to compromise and fund the National Parks. Obama has said he will veto this compromise legislation. As a result, along with 24 other military cemeteries, the D-Day memorial in Normandy has been barricaded. Obama Tries to Close Privately-Funded Mt. Vernon – Although George Washington’s Mt. Vernon estate is privately funded, the feds blocked visitors from entering the parking area because the Park Service maintains the lot. Apparently, the New Media publicity resulted in the feds backing down. Obama Closes Over 100 Privately-Managed Parks That Cost No Money to Run – The U.S. Treasury actually makes money from the rent paid by a private company that “employs about 400-500 camp workers and managers across about a dozen states.” No federal money is used to operate these parks. No federal employees are used to staff these parks. Taxpayers make a profit from these parks. Still, Obama had them closed and as a result 400-500 employees and a private business are taking it in the neck. Obama Closes Vietnam Memorial – The GOP have passed compromise legislation that would fund national memorials and parks, and open them to the public. Obama threatened a veto. Apparently, the “essential” government employees are those erecting barricades, not those who could keep the memorial open. [Two late additions courtesy Kevin Baker] The National Park Service evicted people from their homes and houseboats on Lake Mead. All of those bulletins have proper links, so go to the source to verify each at your leisure. The President of these United States, member of the Democratic Party, argues that striking workers deserve to be fired. Think I made that up do you? Will someone who knows how tell me how to save this youtube? Because I believe the White House, after someone there awakens from their drunken stupor, is gonna be putting pressure on Google to send this down the memory hole. Save this folks. It's a gem.